A fusion of Japan and London, Shochu is more widely known for its exquisite food, dynamic murals and flowering indoor blossoms. The Shochu Lounge is the little sister of the rapidly expanding Roka restaurant chain known for a high class eating experience. 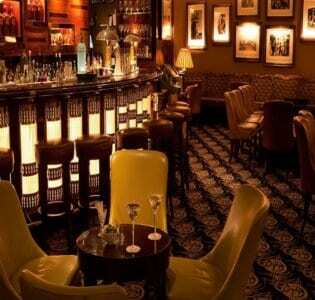 This bar mimics the family style of luxury, extravagance and indulgence. Walls are lined with the namesake Japanese beverage, similar to vodka but based on rice, sweet potato, sugar and chestnut recipes. Dark wood is a sumptuous theme throughout the lounge. A Japanese based menu strays from the common bar staples, instead offering an opulent yet affordable cocktail range, with the majority of drinks beautifully presented in themed glasses and mugs. 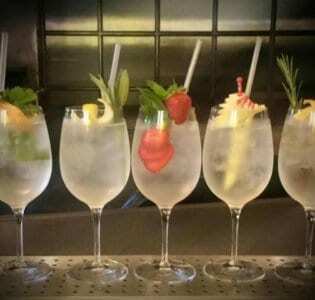 Cocktails are grouped by theme, and we’ve chosen one from each to encourage you to have the full Shocho experience. Hiro’s Ghost, under Japanese Innovations, only adds to the décor in its Samurai glass with absinthe complimenting the flavours of whisky and guava. Under Roka Innovations, go for the splendid Pink Pine Fizz, topping pink pepper gin, pine bitters, egg whites, spice syrup, and Campari with pink pepper soda. For the fans of a classic, Roka Signatures Samurai Bramble twists a traditional recipe with tequila, vanilla and crème de violette. Finally, from the Modern Classics group, we’d suggest the tropical Shochu on the Beach, with shochu, peach and passion fruit. The cocktail menu compliments the vast menu from sister restaurant Roka upstairs, and anything from this menu can be ordered down to the relaxed lounge setting. 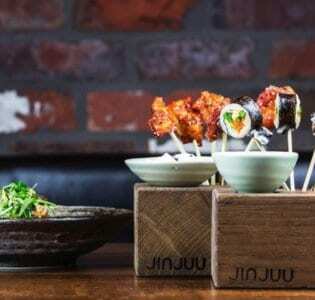 To further your Japanese experience, we suggest the scallop skewers with wasabi and shiso, or the beautiful baby back ribs with sansho and cashew nuts.